I have a certain love for the rustic, nubbly, barber-pole, thick-n-thin goodness of handspun yarns. I love using them, but I love collecting them even more. I’m not a spinner, so I have to find creative ways to satisfy my handspun yarn yearnings. For example, I seek out commercially-available yarns which have that rustic look and feel: Mirasol Hap’i and Araucania Nature Cotton both find a home in my stash. Next, I joined the Crown Mountain Farms Sockhop Club, which promises fabulous handspun deliveries throughout the year. Last, I’m always on the lookout for Etsy sellers who carry handspun yarns, or even take custom hand-spinning orders! After a tip from my friend Bertha, I contacted one such seller – Missy, A Tree Hugger’s Wife on Etsy. I am deeply sorry that her shop is currently on vacation, because I think you would find Missy’s typical offerings beautiful – fiber and yarn in saturated, unique color combinations. I asked Missy if she could take one of her standard funky colorways, “Retro Kitchen,” but customize it for me by using a superwash merino, spinning it to a sport weight, and making a large 8 oz. order (that’s half a pound, people!). She agreed! Oh, yes, it’s so fabulous, it deserves two pictures! I was extremely satisfied with my order from Missy, who was exceptionally quick, and kept me updated throughout the entire ordering-dyeing-spinning-shipping process. The product speaks for itself. If you’re like me – love the handspun, but don’t spin – do not hesitate to contact Missy with your proposal! The funny thing is that I requested 500 yards of this yarn, thinking I’d knit it into something substantial – funky knee-highs or a toddler sweater, maybe? But my first plan is to use a mere fraction of the yarn, combine it with a complementary solid, and knit a tiny baby hat. Maybe a variation of the Baby Bonnet from Last-Minute Knitted Gifts ? it’s so funny – i LOVE handspun too… but I can’t see myself getting into spinning. 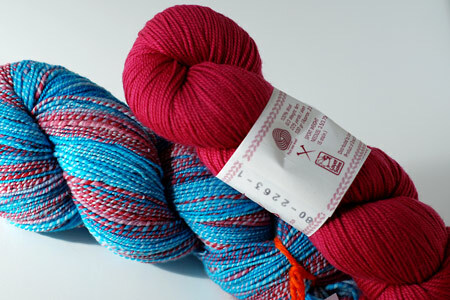 i have some sock hop yarn that is waiting for just the right project – it’s so beautiful! i can’t wait to see what you decide to make! That is a gorgeous color combination and that pattern will be adorable. 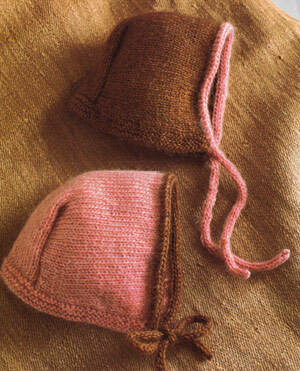 Makes me want to have a little one to adorn with knitted gifts. I’ll just wait for my friends! That’s going to be delicious. What a superb use of handspun! The yarn is beautiful. Are you sure you don’t want to try spinning? Because it’s fun (maybe a little addictive) and you can make all the yarn you want! I started a couple of years ago and I’m loving it. The yarn is lovely! I’m so happy to hear that you enjoy knitting with handspun. I’ll have to remember to send you the link to my shop the next time I have handspun in it. Can’t wait to see the hat. I. adore. that. colorway. SO retro! SO kitchen! One of my friends has a house with the original retro countertops still in it, with those rounded triangles in the pattern, kinda like the jetsons. sigh…lovely! Oh yay!! 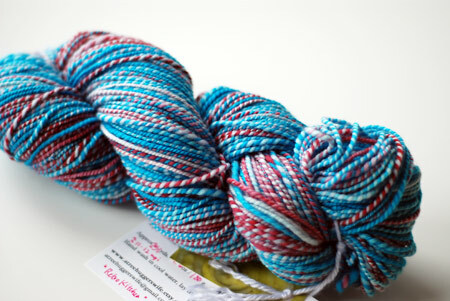 You picked such a gorgeous colorway! It looks amazing all spun up! Missy is such a sweetheart, I’m so glad you like her handspun and I can’t wait to see how this knits up! its beautiful! I love those barberpole handspun yarns too! Those are very happy colors! I will add her to my etsy favorites! That yarn is gorgeous! I can’t wait to see it knit into something! wow beautiful yarn! i love the barber poll look of it! The home-spun yarn goes perfectly with the red yarn. Together they’d make the cutest hat, or cardigan, or. . . just about anything! Lovely colors, both the retro and the red. I’m eager to see what you do with the bonnet pattern. I tried it last year (with Be Sweet bamboo, a mistake) and couldn’t make it work with such a slinky yarn, but I always meant to try again with something more appropriate. You’ll have to modify for sport weight, presumably. . .
Oh how I heart that bonnet! Forgot all about it! As a collector of Crown Mountain Sock Hop yarns, I can vouch for the color, texture and hand of knitted garments – even those made with simple garter or stockinette. I’ve also made the LMKG baby hat. Lickety-split and cute as anything! The new mom loved it. That Bertha is full of good ideas! Love this colorway, is basically perfect. What a gorgeous combination of colours. Red and turquoise is so beautiful together. that handspun yarn is absolutely gorgeous! fantastic colors. can’t wait to see what you turn it into.